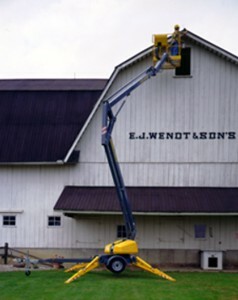 Paw Paw Rentals can be an important tool for contractors and can be used in many ways. We understand your business challenges including how diverse your skills are. But just because you might have to do a certain type of job from time to time doesn't mean it makes sense to own the equipment for every job there is to be done. Renting is less expensive than buying if the equipment is used less than 70% of the year. And the repair and maintenance of the equipment is a distraction from what you do best ... from what makes you money. It also allows you to discover better tools without buying and storing them at your own expense. This is why Paw Paw Rentals can be your partner. Your job is to do contract work and perform. Our job is to provide you with the tools you choose that will help you get the job done efficiently and cost effectively. We provide you with updated models as well so you can work more efficiently. This will effect your bottom line. If backhoes, bobcats, trailers, compaction equipment, or any other tools you don't own are needed for you to get the job, we will provide them. Contact us for pricing and see how easily you can expand your offerings to your client base without investing in new equipment. Select Here Air Compressors Air Tools & Accessories Automotive Tools Carpenter Tools Compaction Equipment Concrete & Masonry Equipment Diamond Blades Earth Moving Equipment Electrical Tools Floor & Carpet Tools Generators Heaters & Fans Hydraulic Jacks & Lifts Lawn & Garden & Household Tools Miscellaneous Rental Equipment Painting & Decorating Party Supplies/Equipment Plumbing Tools Pressure Washers Pumps & Hoses Saws Scaffolding Signs & Letter Sets Skid Steer Loaders & Trenchers Trailers & Moving Equip.